AP1578C, K, L, M, N & P. 2nd edition. Original copy dated 1/44. 42 pages with pullout diagrams/photographs. 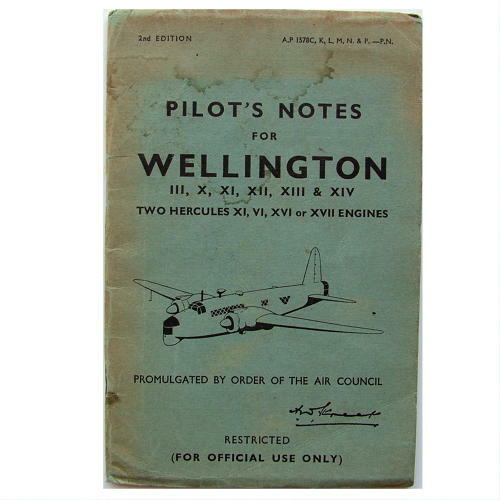 Covers a general description of the aircraft including fuel and oil systems; aircraft controls; engine controls; other controls including bomb doors / bomb & depth charge release, torpedo release; heating controls; reconnaissance flares etc. Part II deals with handling, part III covers operating data, part IV emergencies. Finally part V has illsustrations of the cockpit and fuel system diagrams. The cover is a bit creased/marked and has dog-eared edges/corners. Rusted staples. Pages generally good - some amendment sheets added. Inner rear cover amendment sheet apparently removed. Good used condition. Stock code P17397.